Can You Make Mashed Potatoes Ahead of Time? Oh yes. You can. You can make mashed potatoes ahead of time. 1. 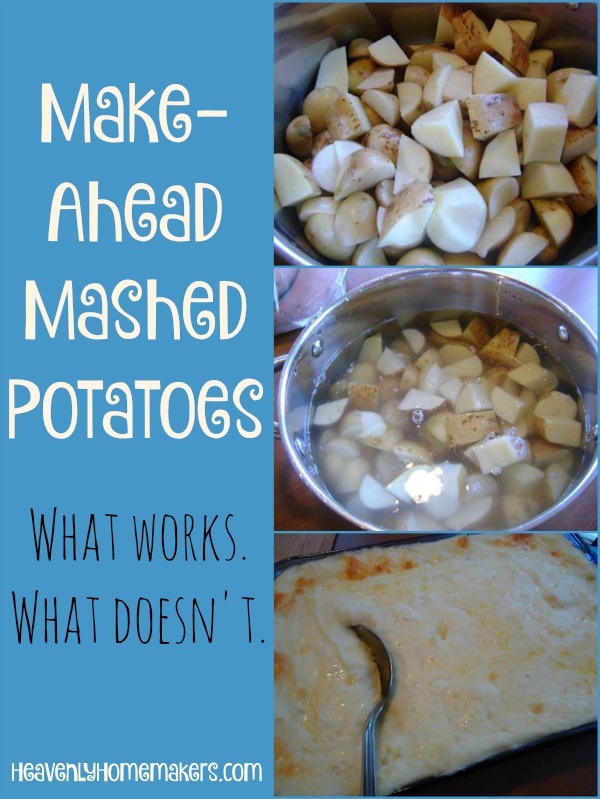 Do not boil potatoes with the plan to mash and serve them later. While this seems like such a good idea, this will turn them into a sticky, gooey mess. 2. Do not make mashed potatoes and freeze them as-is. I’ve never had success with this. Plain mashed potatoes freeze fine but thaw weird. They are always watery and unappetizing. These are not the kind of potatoes I want to include on my holiday table. 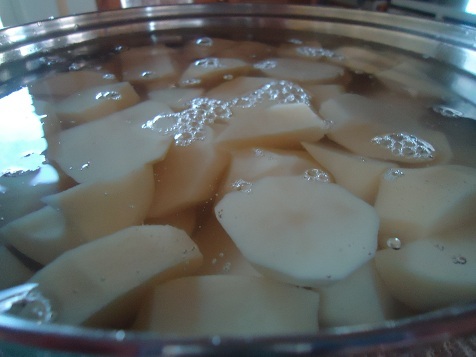 If you do freeze them as-is, you must cook the frozen/thawed potatoes in a pot to steam off excess water that has formed in the freezing process. More info to come. 1. Scrub or peel the potatoes and put them into a pot of cold water. 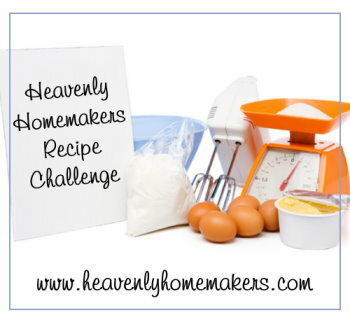 Want to get the prep work out of the way on a busy day filled with meal preparations? Typically I pull my family into the kitchen the night before the holiday meal. Together, we scrub and chop potatoes. We put them into a large pot, cover them with cold water, put on a lid, and leave them until boiling and mashing time the next day. 2. Make mashed potatoes, then use your crock pot to keep them warm. What I find very helpful is to follow all the instructions detailed in #1 to prep the potatoes the night before. The next morning – hours before our meal – I cook, drain, and mash. I then put them into a crock pot (with butter, always) on the “keep warm” setting until serving time. In the meantime, I can wash and put away the potato pot, then focus on other meal prep that needs to be done. 3. 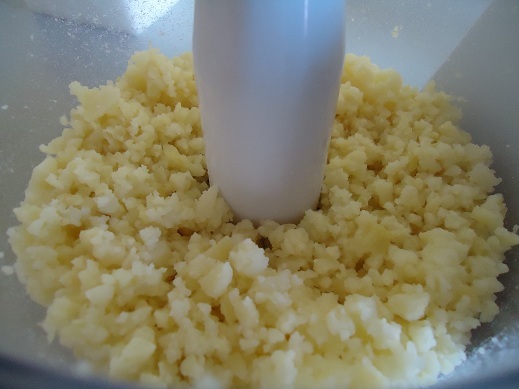 Embellish the mashed potatoes before freezing them. 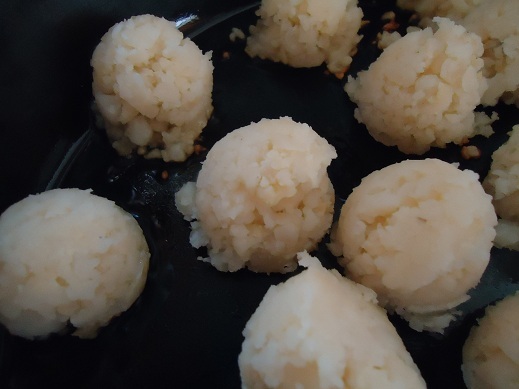 While mashed potatoes don’t freeze well as-is, they do freeze well if you add some goodies to them. Take a look at the recipe below for all the specifics! When made like that, they do freeze well. Or, at the very least, you can make them a few days before your holiday meal, refrigerate them, then bake them on serving day. This is the method I plan on using this holiday season. 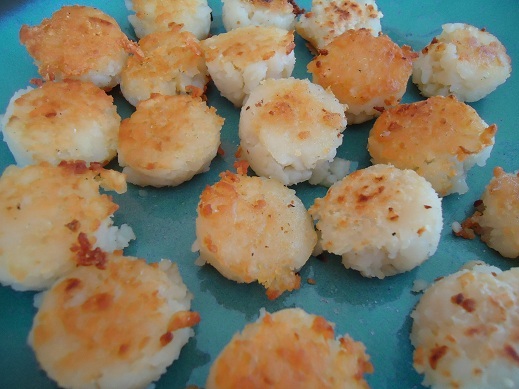 Cheesy Mashed Potatoes are always a huge hit. You can’t go wrong with sour cream and cheese right? Boil them in water until tender. 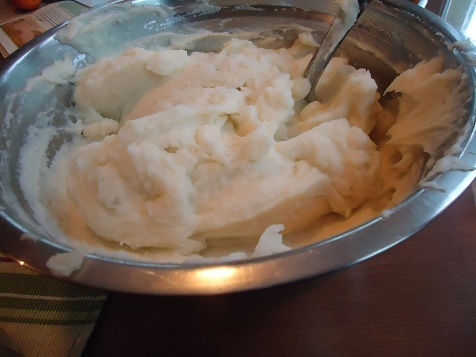 Drain water and mash potatoes with milk and salt until smooth. Stir together the mashed potatoes, butter, and sour cream. Spread into a 3 quart casserole dish. Bake in a 350° oven for 45 minutes. Make the potatoes as directed in the recipe above. All it to cool completely. Cover and freeze for up to three months. To bake and serve, thaw potatoes in the refrigerator and bake as directed. OR, cover the frozen dish with foil. Place the frozen dish of potatoes into a cold oven*. Turn the oven on to 250° and bake for 2 hours. Turn the oven up to 350° to continue baking to heat through. *Be sure your oven is cold when you put in the frozen dish! Otherwise, the pan will crack because of the extreme temperature change. What has been your experience with making potatoes ahead of time? Simple Meals is here! It’s saving my brain (and many of yours too!). If you haven’t joined yet, now’s the time. Get all the details here! Tonight’s soccer team dinner includes a baked potato (or two) for everyone. 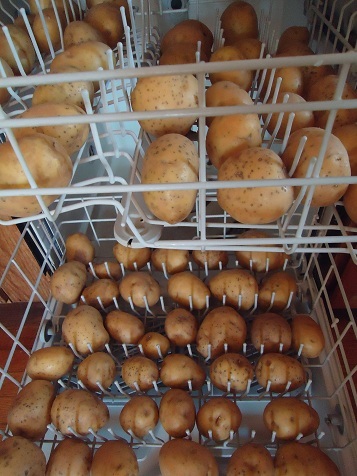 When cooking for a large crowd, I always wash my potatoes in the dishwasher. Never heard of that idea before? Read more about it here. It’s a huge time saver. And while we’re on the subject of potatoes, I should let you know that after I wash them in the dishwasher, I’ll throw them into a crock pot to cook. (Or in this case, a huge roaster oven.) Love how easy it is to feed baked potatoes to a crowd! It’s been months since I posted a High Five Recipe, so just in case you’re new around here…let me introduce you to this special recipe feature we have going on. Are you ready? It is a fact that there are lots and lots of healthy recipes you can make which only take five or less (healthy) ingredients! I’m talking about REAL INGREDIENTS too…not just “add a packet of this and stir in a can of that”. Real ingredients, real easy recipes. 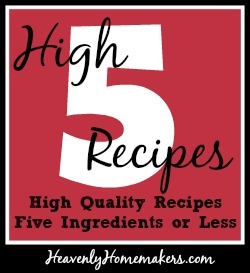 I LOVE High Five Recipes! You can scroll through all of these posts to see the other High Five Recipes I’ve posted so far! 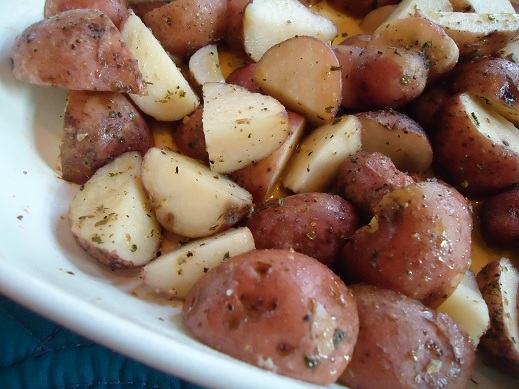 This Roasted Italian Potatoes recipe comes courtesy of my friend Anne. Remember last year when I put some of my homemade Italian Dressing Mix in her stocking? What, you don’t remember? Yes, my friend Anne and I exchange Christmas stockings. Grown-ups needs stockings too ya know. And because she and I love to live on the wild side, we put items in each others stockings that are incredibly outlandish like paper clips, pot scrubbers…and yes…Italian Dressing Mix. Yes indeed, Anne and I create one great big rowdy party when we come together. Anyhoo…after Anne tried the Italian Dressing Mix I had given her, she fell in love with it and keeps coming up with yummy things to make with it. She is out to prove that Italian Dressing goes way beyond tossed salad. See? Told ya she was a crazy one. 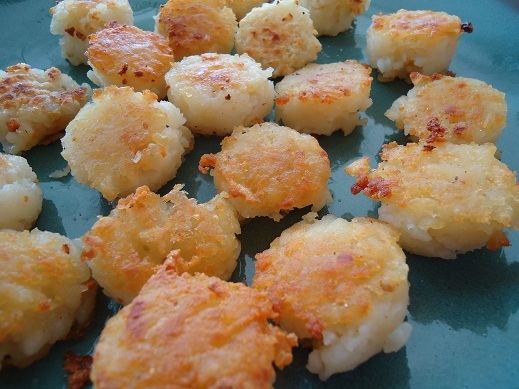 Cut potatoes into bite sized pieces. Toss ingredients together in a bowl until the potatoes are covered with olive oil and dressing mix. Pour potatoes into a baking dish. Bake uncovered in a 350° oven for 20-30 minutes or until potatoes are tender. If you like, you can broil them for a few minutes at the end of their baking time to brown them up a bit. Now, I am creatively thinking about what I should put in her stocking this year. Maybe some other great ingredient so she can come up with another high five recipe? Perhaps something to do with, I don’t know…chocolate??? Several of you have requested to see how our garden is growing this year. Therefore, I braved the millions of mosquitoes and took several shots of our glorious soil with green things growing out of it. I can take absolutely NO credit this year for how the garden looks. Matt has worked VERY hard and keeping the weeds under control and everything looks so, so pretty. I basically started on one end of the house and went all the way around the back to the other side taking pictures. Yes, we have more than one garden spot. If it has the capability to grow things (and it isn’t an area used regularly to kick soccer balls), it has been tilled and it shall bear fruit. Well, vegetables as the case may be. Here we have several tomato plants and some pepper plants. Looks like the beginnings of salsa, wouldn’t you think? Ah, more tomato plants. Yes, there will be many tomatoes. We are not afraid. Ooh, the first fruits. Vegetables. Wait. Tomatoes are a fruit. We planted the corn in two stages so that it would be ready at two different times. The first round is just a bit taller than me. We’re so proud. Here are more pepper plants growing in the raised garden bed Matt made last year. Our yard is really not crooked. I just took a crooked picture. Here’s our little garden of potatoes. See all the blossoms? That means there are lots of french fries growing underground. Beside the potato plot grows our beloved peach tree. There are only a few peaches on it, so this year we will be mooching peaches off of others if possible. The tree sure looks pretty though. I picked a whole bowlful on Tuesday!! When I steamed some that night, I thought perhaps I was in heaven. And then we may or may not have steamed more of them for breakfast this morning. Who could resist? Had I not tasted these potatoes myself (when my friend’s mom made them) and realized that I had just bitten into a bite of comfort food heaven, I would not have believed that these three little ingredients all by themselves could actually create such a wonderful side dish. All of the other scalloped potatoes I’ve ever made have required quite a bit of work: prepare potatoes…make a white sauce…layer the potatoes with the sauce…cook covered for a specific amount of time…then uncovered for another specific amount of time. But this potato recipe? Scrub and slice potatoes. Sprinkle with salt. Pour cream over potatoes. Bake. Stir every once in a while. Eat. Try to be nice and share. No really Laura…please pass the potatoes. Scrub potatoes and cut into very thin slices. Spread into a casserole dish. Sprinkle with salt. Pour cream over potatoes. Bake uncovered at 300° for 1 1/2 to 2 hours, pulling dish out and stirring occasionally. 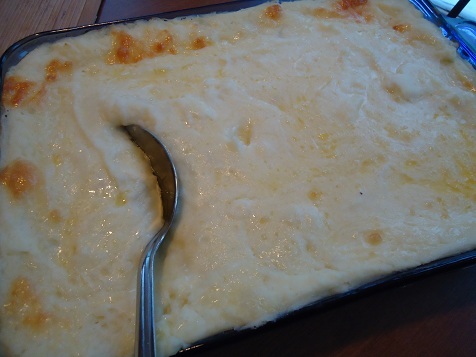 Serve when potatoes are tender and cream has thickened. The starch from the potatoes naturally thickens the cream into it’s own white sauce! SO simple! Now, you’re welcome to throw in some onion or even sliced carrots into this dish if you want more flavor. I personally love it with just a generous amount of salt. 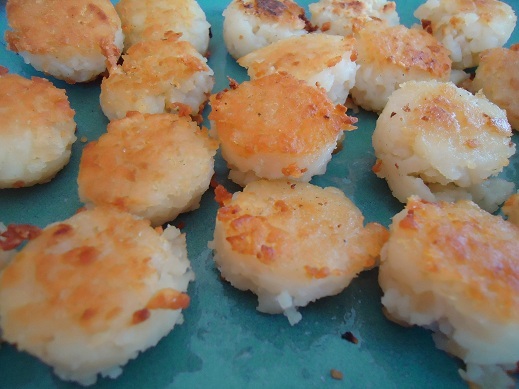 This potato dish is inexpensive, healthy and takes very little time to prepare. And it tastes like comfort food heaven. What more could we ask for?